In a time of change, the question is not whether to innovate, but how. For tea, it’s also urgent. There are challenges to business as usual everywhere: sustainable development, shifting consumer tastes and demographics, coffee competition, yields, costs, and quality, to name just the obvious. The good news is that if “Necessity is the Mother of Invention,” mom’s been getting the kids up early and pushing them hard to do their homework and get a job. There’s innovation everywhere. Here’s a mapping of innovations that are promising in their early results and building critical mass. Innovation success offers large potential payoffs in these four value spaces: in the garden, along the supply chain, in the product, and in selling and serving. The map lists just a few of the inventions that are already producing evidence of value for tea producers, sellers, customers, supply chain partners, regional economies, etc. They are all beyond the invention stage, though full rollout and payoff may take years, face roadblocks and demand new project management capabilities. If innovation were easy, every firm would make it part of everyday business life. It isn’t easy but the mapping shows the benefits are worth the effort and risk. The message is: Watch This Space. The key value element of innovation in the garden is Quality: harvests, leaf, maintenance of terroir, sustainability, safety (pesticides, contaminants), and certification of source, pedigree and authenticity. There is already a strong base of effort and expertise in this core space: biomanagement, organic farming, soil treatment, etc., with sustainable development the primary long-term and yields short-term goals. There are a variety of technological and scientific developments that add significantly to this foundation. The drone is close to being at the “killer app” stage where just one proven payoff is so compelling that it justifies the entire investment and moves from innovation to necessity at a rapid growth pace. 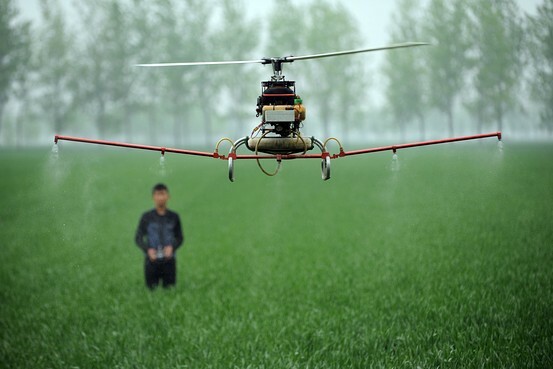 Drones are simple to operate, can fly anywhere at low height, carry cameras and 10-35 kilograms of pesticides, fertilizers, etc. Spraying: water savings of up to 90%, chemicals reduced 30-50%. Planting: decrease in costs of 85%. Prices for drones that handle core functions of aerial surveys, light spraying, crop monitoring, tracking of water levels, weed growth, etc., cost around $1,800. Ones with multi-device and extra payload capabilities are in the $15,000 range. Operating costs are low. 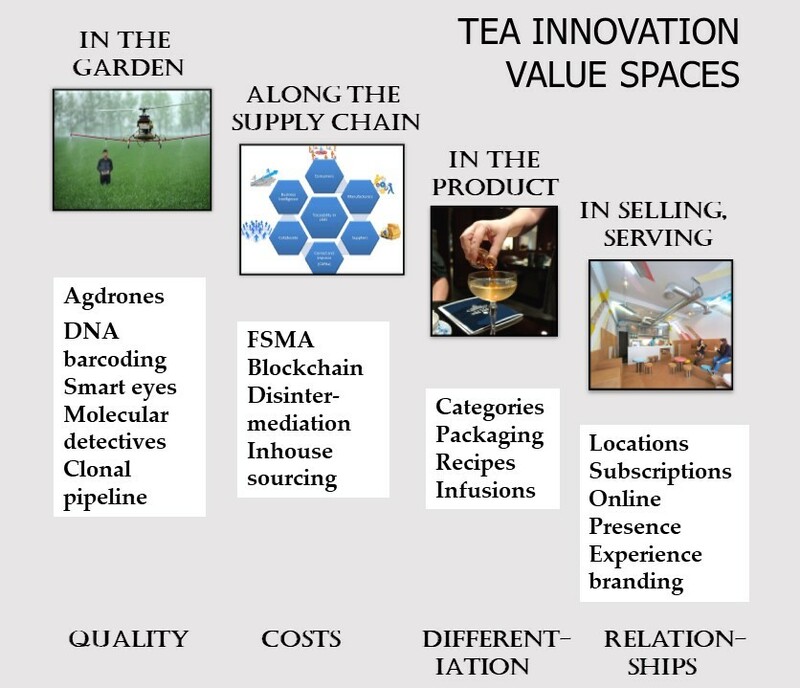 There is a growing cluster of tea innovations that exploit combinations of camera tools, sensors, neural machine learning models and artificial intelligence algorithms, biogenetics, image recognition, ultrasound, infrared and spectrometry. (They are discussed in an earlier Tea Journey blog). 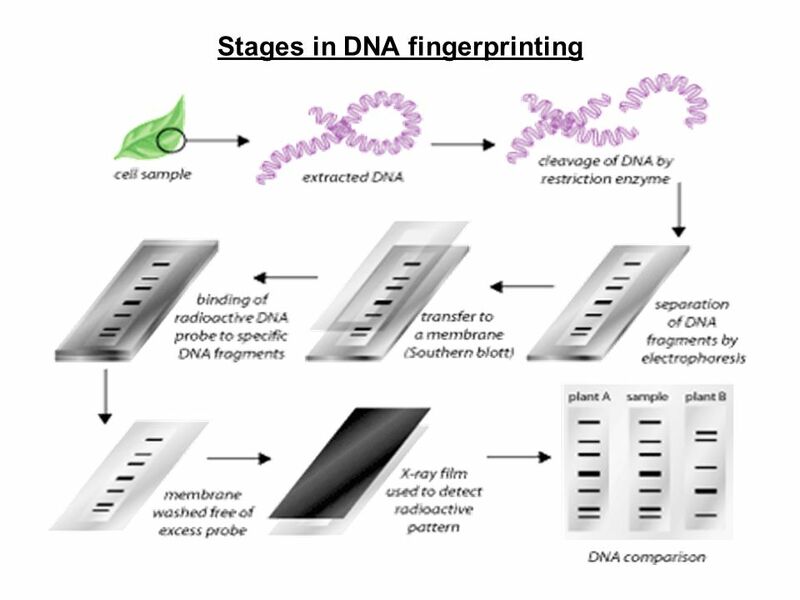 DNA barcoding uses a snippet of an organism’s DNA as a genetic marker that uniquely identifies it as belonging to a variety within a species. For tea, it distinguishes right down to country of origin, regional differences, presence in databases of approved ingredients, and unlisted plant materials. Studies report a consistent 99%+ accuracy in classifying 40 or more very different teas, from just a leaf fragment. A Taiwanese study picked out domestic versus imported (and hence counterfeit) whole leaf teas out of a population of more than 60 varieties. Smart eye software applies AI techniques to distinguish between healthy plants and weeds, including rare specimens, either visually or via infrared. An individual weed can be singled out for spraying or extraction. Full scale implementations report reductions of 90% in herbicide use. The robot devices go beyond what they can just see to what they can sense. One AI system can determine the exact varietal origin of a batch of harvest from a single leaf: 100% accuracy in distinguishing 14 different premium teas from each other and fakes, including Bo Li Chun, Yunnan puehr, Assam, and Taiwan oolong. 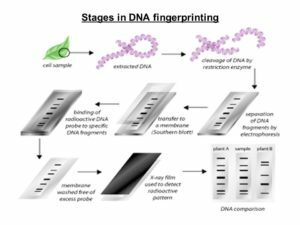 Molecular detection is being added to smart eye devices that can capture extracted DNA, genetic fingerprints, aroma traces, and even measures of leaf texture, vein pattern and smoothness. The transition in research is from being able to study how it affects our body chemistry to what’s controlling our DNA’s environmentally-induced change. The possibilities are endless. The chemistry of tea is in itself a productive field, but the biogenetics of tea expands it to a new vista. Clonal teas take 20-30 years to develop and bring to full production. They are natural – non-GMO – adaptations selected and bred to provide specific characteristics: water usage, disease resistance, flavor, yield, etc. Landmark examples include the varietals that are the base for the entire Japanese tea industry, the Darjeeling AV2 clonal standout in flavor and aroma, the purple tea that has transformed Kenya’s competitive positioning in the global market. The clonal pipeline continues to flow and seems likely to fill and move faster with molecular and AI tools and the decoding of the tea genome, the longest so far found in plants, four gigabits in length. 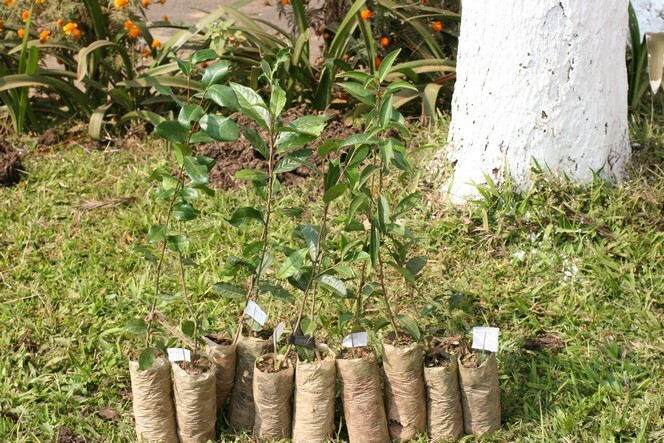 Clonal replanting of higher yield bushes is increasing quality in many countries, such as Malawi, Uganda, Kenya and Indonesia, helping them escape the commodity trap of falling prices and lowered productivity for low end tea exports. Tea has been marked by fragmented, inefficient, slow and expensive supply chains. China teas often take two years from harvest to display in a US store. Transportation costs for small growers and sellers are a large fraction of costs. There is weak audit and quality assurance, lack of standardization and an accumulation of costs along the delivery chain with growers increasingly squeezed on prices. The general estimate is that for every $1 of direct product cost, three “soft dollars” are added along the supply chain for non-value adding administration, waste, duplication of paperwork, delays, and rework. The value potential of innovation in this space is substantial: Cost reduction of the soft dollars. 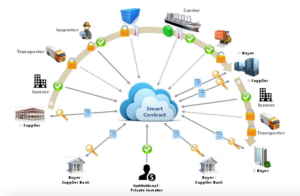 Three priority opportunities are apparent: Blockchain (coming soon), the stimulus, tools and blueprints (building momentum now) of the Federal Department of Agriculture FSMA (Food Safety Modernization Act), disintermediation of inefficient and unneeded parties and processes (well underway), and inhouse sourcing through contracts rather than reliance on markets. Blockchain is the secure technology behind cryptocurrencies, most notably Bitcoin. Its far wider applications are illustrated in a recently underway one-year project sponsored by Unilever. This has been launched in Malawi to link tea farmers to Unilever, Sainsbury, the giant UK supermarket chain, three large financial institutions, and technology services. 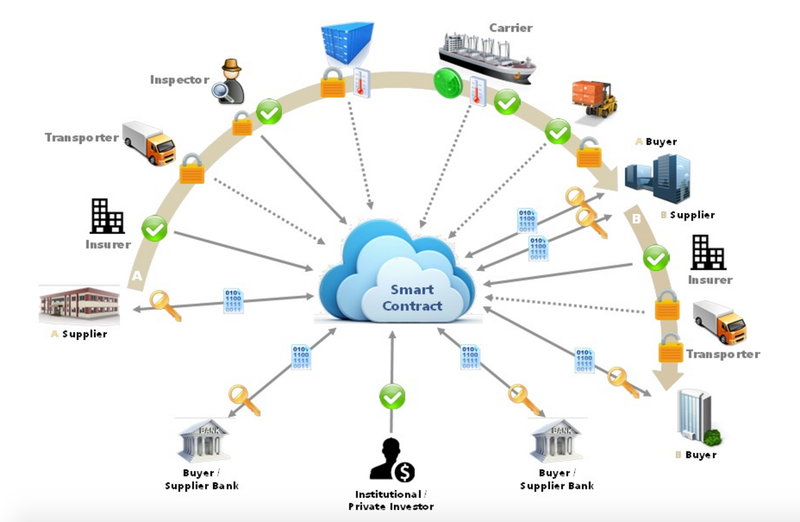 The integrated capability will track and verify contracts, automatically triggering payments. It will provide information to authorized partners and consumers on origin, provenance, and quality. Buyers will be able to offer preferential pricing for growers whose teas meet blockchain-verified standards for sustainability. Banks automatically track the ones that are shown through the time-stamped tamper-proof records to be meeting performance metrics. Think of blockchain as a ledger of accounts and records for every component of a transaction and relationship that maintains a prefect and secure information and audit trail. These are accessible to every registered member of the blockchain network. This comprehensive Federal program is being phased in over a multi-year period. While there are concerns about the costs of compliance for small firms, it both provides specific solutions for handling issues in tea of quality certification, pesticides and contamination alerts and action, the counterfeiting of specialty teas especially puer, grower/supplier record, etc. A few of the main features of FSMA are: Science-based early prevention versus late remediation, extended and expanded inspection and compliance, fast response, importer accountability, and enhanced partnerships. The complexity of the tea trading and supply chain systems of the past largely added intermediaries to handle issues of fragmented and scattered farms, unpredictable weather and unreliable harvests, lack of coordinated information, the long transportation paths from mountain paths to rural trucks, bulk shipping, and retail distribution. Many of these retain value but we are seeing more and more bypassing of auctions via contracts, direct grower to customer sales, and new trade and processing hubs. (Dubai is the center for shipping, blending and packaging of “English” tea bag brands and the world’s largest re-exporting center.) Companies like Sainsbury, the UK grocery chain are consolidating sourcing in-house, extending their relationships with growers, such as FairTrade, The recently merged Rainforest Alliance and UTZ set up supplier networks directly equivalent to those of high tech firms such as Apple and car firms like Toyota. It’s clear that something big and different is happening in tea products. The traditional branding categories – green, black, etc. – no longer provide the base for growth. The obvious instance is the UK. Consumption of black teas has dropped by more than 20% since 2012. Green and herbal teas offset the erosion, but coffee is the growth segment. Younger folk more and more report themselves as foodies. They take their drinks outside the home, dropping in on coffee shops and cafes most often. This has seen a surge in entirely new tea categories: examples are bubble tea, cheese tea, matcha, kombucha, cold brew, and even alcohol-infused teas. On the horizon are neutraceuticals, athletes, tea where caffeine, the villain for wellness and herbal tea products, is a healthy boost (Harney’s Athletea line), and recipes that add just about any flavor enhancer and taste experience, including probiotics (Bigelow), hemp, bacterial yeast, apple pie and, this year’s product novelty turmeric. Cold brew “interest has shot from a murmur to a veritable howl” since 2012. The surge of interest seems to be “DIY” convenience of kettle-free preparation and the “smooth”, “bitter” and “chocolately” taste. “Earthy” flavors are “top of mind” in every market, with matcha, ginger, turmeric, and chai standing out. Much of the interest seems to reflect a “foody” trend. Matcha is a hit for its rich, creamy smoothness in cakes, cookies, and ice cream. Water is a new area of concern for concern for consumers: safety, filtering, bottled, premiumization, sparkling, increased PH levels, and many other topics. One distinctive and surprising aspect of the survey and the analysis is that traditional tea barely registers. In its more than 60 pages, there are fewer than a dozen words in total referring to oolongs, white teas or even lattes. The picture that emerges in all four markets is that interest in tea is predominantly for non-traditional, non-caffeinated, non-whole leaf infusions. Tea packaging has largely centered on design. Tea tins, tea bag envelopes, boxes of teas, and package labels are surely the best designs on the supermarket shelves. Packaging innovation is adding new dimensions of functionality to visual flair. High end teas are shipped in a vacuum packed sealed envelope of laminated pouch. The materials used to make tea bags have always involved compromises, many of which get in the way of conservation. The search has been on for decades to find materials that combine the porosity, fabric strength, and heat handling required for the tea to brew and at the same time are chemical-free and nonleaching. The ideal would be a completely biodegradable bag. This seems at last to have been achieved. The British Co-op company, which sells over a million tea bags a day, is rolling out a bag that is completely biodegradable. Other developments in packaging use new types of specialty paper. Lightweight glassine paper is acid free and recyclable. Its extra porosity permits the use of larger leaf than the lower quality dust and fannings. A major area of innovation is information-centered: self-adhesive labels, QR coding, wireless and enhanced security and certification data. The selling and service tea value space is one of its historical strengths and growing weaknesses. It is built on tea as a product bought to be drunk at home or in an office. There are three main types of shopping outlet: grocery/ supermarkets, specialty stores and websites. Tea rooms and tea houses attract tourists and family groups but most Americans, Indians, Asians, and even Britons never regularly visit a tea service location. The core of marketing is branding the product and differentiating the packaging. There’s a huge shift in customer relationship-building that moves away from this shopper-buyer tea product focus. It’s most marked as companies learn how to engage Asian millennials. Fusing tea and food: designing flavors with tea as an element enhanced by nontraditional recipe mixes. New upmarket tea boutiques, bars, shops and houses aim to build a new generation of tea lovers rather than serve the existing one. Singapore’s TWG aims at encouraging tea appreciation, mixing standard and exotic teas, such as China Yellow Gold Tea Buds. 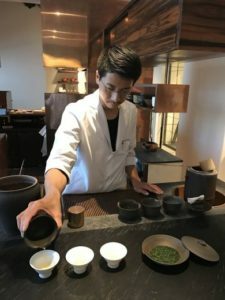 In Tokyo, Sakurai offers a Japan Tea Experience in a rich décor of timber, copper, tea vessels, and paraphernalia that complement a menu of highly original tea blends and recipes. At the convenience end of the market, Chai Point in India is building a franchise of drop by stores. 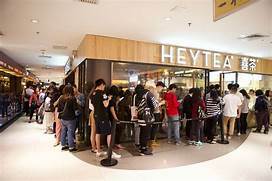 Heytea’s Cheese Tea cafes build long lines in Shanghai. A product is not a relationship. In the new markets – new customers, preferences, lifestyle priorities, demographics and foods – tea companies have to think through what they are branding. The main trend in the Selling/Service value space is to brand the experience. Tea subscription services offer innovation in building and deepening customer relationships. The attractions are clear and varied. 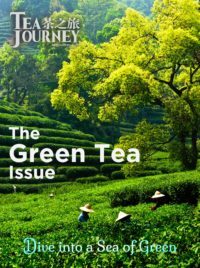 Above all, they offer subscribers simplicity in exploring and discovering new teas, education and information about tea, and convenience in stocking up, generally monthly. 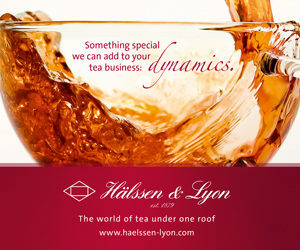 Upmarket subscriptions highlight the providers’ personal expertise in choosing the teas. They generally offer small batch specialties, 0ften from online sellers’ lists. Others are theme-centered (wellness teas, Ceylons, black artisans)and a few personalize the offers, on the basis of self-profiling. The value space mapping is obviously selective and incomplete though it captures the main dynamics of how leaders are mobilizing to turn the challenges of change into opportunities. An obvious set of questions for small and large tea industry players are: How up-to-date are you on what is happening in the spaces? Which offer most value for you? 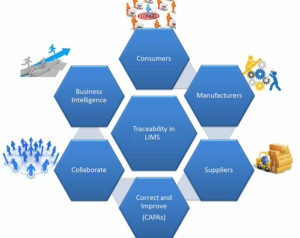 How well-positioned are you in terms of capabilities and partners? And, what’s your plan? Surprised not to see more emphasis on inventory levels (all the way through to consumer cupboards). Why for instance should there be 2-3 year shelf-lives when “freshness” is actually a selling point? Why would selling on Buy-One-Get-One-Free basis help with a freshness platform or shelf-life velocity? (BOGOF just slows down the re-purchase. It doesn’t make the consumer drink more – AND it means the consumers final “product memory” before re-purchase is that of a stale product). Do/can retailers and packers work closer to JIT? Granted if you have seasonal products (eg Darjeeling) or half-seasonal dependent products (Argentina/Malawi) 12/6+ month supply chains might be appropriate but the reality is at LEAST 2-3x that if not more. Someone is paying for all the financing and storage….. These inventory lead-times are not supply chain complexity issues (tea only takes 6-8 weeks to destination these days) they are procurement/production/sales planning issues at the consumer market end. A fresher, faster-moving product would benefit everyone in the industry. Let’s focus on product quality as well as costs.